So much for the whole "it's the system and not the QB" argument. In his second career start, Patriots rookie quarterback Jacoby Brissett was ineffective, often overthrowing receivers and being unable to move the Patriots down the field consistently. 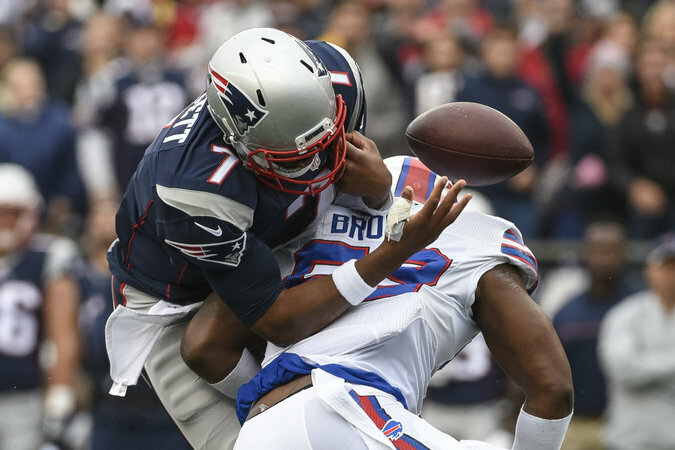 Brissett also fumbled on one of New England's four trips into Bills territory, eliminating what looked to be a promising drive in the second quarter. The Patriots were only able to convert on one third down under Brissett, going 1-for-12 in all. He had a couple of key misses, as he failed to connect with a wide open Danny Amendola on third-and-19 late in the third quarter, as well as Chris Hogan on a deep ball early in the fourth quarter. Brandon Bolden also dropped what would have been a touchdown in the third quarter. Brissett finished his day going 17-of-27 for 205 yards, which might make you think that he did his part. But of course, sometimes the box score doesn't accurately reflect what really went on. With Jimmy Garoppolo inactive and the Patriots obviously not wanting to go to Julian Edelman, some may wonder if Brissett was playing more banged up than first thought. Brissett didn't have the same accuracy he showed in Week 3 against the Texans. While his performance last Thursday was definitely encouraging, it would have been unreasonable to expect a rookie with a limited playbook to set the world on fire. Even with that in mind, this game was ugly. Brissett also took a couple of big hits and seemed to be laboring a bit at points in the second half, which may have contributed to his subpar performance. Overall, it wasn't a banner day for anyone associated with the Patriots aside from Martellus Bennett, who had another 100-plus yard game. Luckily for the Patriots, Tom Brady's suspension ends at midnight tonight, and they'll have him under center next week against the Cleveland Browns.